The house (shown on left) also has an impressive vaulted ceiling to its generous Kitchen with bi-folding doors onto the garden, with similar doors and aspect from the Sitting Room creating a fabulous living experience. The ground floor accommodation features underfloor heating and includes a Guest Bedroom with En-suite and a versatile separate Study. Further bedrooms to the first floor boast a Master with spacious main En-suite plus the main Family Bathroom all with mains gas to radiator heating. Early reservations can include choice of carpet colours for the first & second floors, choice of tiling to Kitchen and choice of oak topped flooring to the Living Room. Plus choice of tiling to walls in En-suites and Family Bathroom. A select development of just two brand new (plus possible Barn conversion STP) detached four bedroom homes. Cotton End is a growing village with popular Public House, Restaurant and an exciting recently completed £9.7 Million Primary School designed by Lungfish Architects and made up of five blocks suitable for 630 pupils. The Cotton End Forest School is designed to be integrated within its environment and will create a cutting-edge learning environment for students. 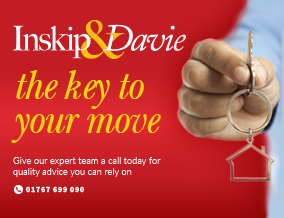 At Inskip & Davie Ltd we strive to be the most pro-active, friendly and helpful Estate Agents possible, should you wish to view this property or require any further additional information please contact a member of the sales team at our dedicated Residential Sales Office. These property particulars are produced in good faith only as a general guide and do not constitute any part of a contract. Any appliances, heating systems, alarms etc if mentioned have not been tested by Inskip & Davie Ltd.
Disclaimer - Property reference cotton7. The information displayed about this property comprises a property advertisement. Rightmove.co.uk makes no warranty as to the accuracy or completeness of the advertisement or any linked or associated information, and Rightmove has no control over the content. This property advertisement does not constitute property particulars. The information is provided and maintained by Inskip & Davie , Sandy. Please contact the selling agent or developer directly to obtain any information which may be available under the terms of The Energy Performance of Buildings (Certificates and Inspections) (England and Wales) Regulations 2007 or the Home Report if in relation to a residential property in Scotland.